The Beauty World Is Global. Brands Need To Understand & React To That. We’ve never been more connected than we are now. In our digital age we can discover what’s going on half way around the world at the click of a button; we can instantly see through the eyes of someone that we’ve never even met via a Periscope live stream; breaking news no longer hits us via our television screens, but on our Twitter feed. Information has never been more fluid and we’ve never been so globally unified towards a common goal – whether that’s against something as serious terrorist activity, or throwaway as Kim Kardashian’s latest naked selfie. From a fashion point of view, that means we can translate what’s happening on a Hollywood red carpet within minutes; from a beauty perspective it means we’re more aware of product news and innovation, even if it means there’s no possibility of it even reaching our shores in the distant future. As travel becomes even more affordable, and worldwide shipping becomes increasingly possible, there are no longer the barriers there were once in place to stop products and ideas amalgamating into one. Although visiting a Sephora store will always have a special kind of appeal, realistically the majority of brands and products are now available across the globe – or at least can be shipped there with very little effort. I’ve recently returned from a trip to Paris with L’Oreal, as part of their inaugral Skin Summit, where they opened their labs and technologies to influencers from across the world. Although the whole experience was fascinating and helped me to understand how much time, effort, technology and money goes into developing a simple face cream, one of the key things that kept my brain on edge was the ongoing insistence of localised product launches. L’Oreal, like many other household names (Unilever, P&G, GSK, Johnson & Johnson), operates in every market across the globe. They’ve historically understood that the needs of women change somewhat dependent upon their location, particularly as cultural influences play a huge part in determining our areas of concern. (China is obsessed with smog; Korea is concerned with brightening; France is all about a pharmacy approach, whereas in Britain we like to keep it simple.) However, as European markets in particular look to our Asian counterparts for inspiration and innovation, the gaps are becoming less and less prominent; not only are we using them as inspiration for the creation of new UK-only products, but we’re actually importing them directly via sites including BeautyMart and Cult Beauty. Global innovation is increasingly accessible and universal concerns are becoming increasingly apparent; although pollution has traditionally been a worry of built-up and smog-filled Asian cities, as we start to understand the impact of this on skin condition and ageing we’re progressively becoming as obsessed as our Chinese counterparts. Micellar water and sheet masks may have seemed like an obscene purchase only five years ago, but now they’re as normal as a hydrating lipstick. We’re moving, merging and uniting into one global entity – and in my opinion this is only going to become more and more apparent over the next five years. There are some cracking launches coming up from L’Oreal over the next six months, but frustratingly not all of them will be available in the UK. Unfortunately for us, their focus is still very much on creating localised products that meet the needs of (men and) women in specific countries, rather than understanding that we could all do with a little piece of that pie. Dullness is a pretty universal concern, so it’s no surprise that brightening products are increasing in popularity; L’Oreal’s Bright Reveal moisturiser and exfoliating pads help to slough away dull and dead skin from the surface, while offering SPF30 and hydration, but they’re only available in the US. Not only is this a huge missed opportunity for them to bring brightening products to the masses, but if and when they do decide to launch a similar product in the UK, the perception will inevitably be that they’ve simply copied other brands rather than identifying a trend and creating products to meet that need. Similarly, a whole range of Hydra Fresh Genius pre-skincare essences have been launched in Asian markets as they’re just as likely to use one of these after cleansing as we are a traditional moisturiser. Although essences are still a new concept to us, the ones that are available are often so expensive that they’re prohibitive to the masses – stalling a trend which could otherwise have exploded. Most frustrating for me is the launch of the UV Perfect City Mist, a lightweight and non-sticky SPF30 spray which can be spritzed over the face (even on top of makeup) multiple times a day to overcome the negative impact of the sun’s rays and pollution. It’s what we’ve been crying out for and could potentially be the answer to getting women to use SPF all year round – rather than just reaching for it when we’re on our holidays – but sorry folks, there are no plans to launch it over here any time soon. I totally understand the complexities of taking a product developed for a non-European market and trying to slot it into an already expansive launch plan, but as both a consumer and beauty writer it’s extremely frustrating that a powerhouse like L’Oreal can’t get their ducks in a line and give the consumer what it wants. 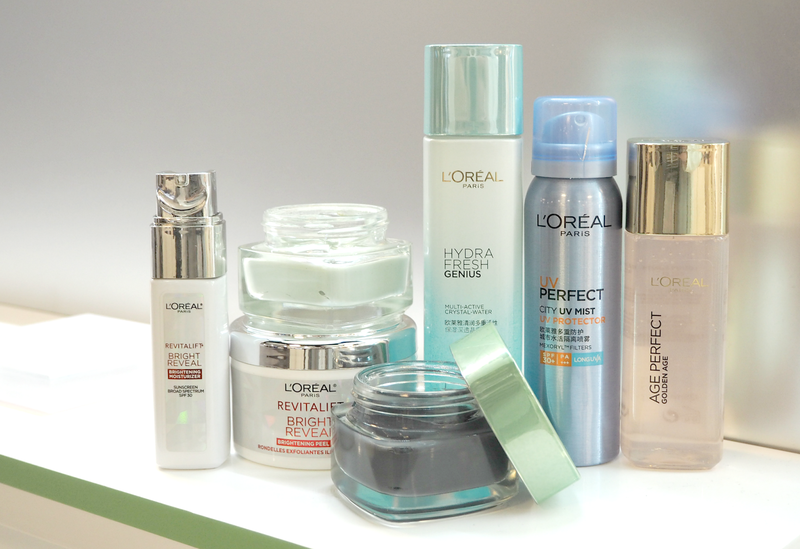 As far as skincare is concerned, I have a perception that L’Oreal just keeps bashing out another face cream that’s not much different from the last, when realistically their labs are developing some of the most innovative and groundbreaking concepts in the world. We just don’t see them. I can’t even remember the last time I covered a L’Oreal skincare launch (if ever) because I just don’t get to experience anything that exciting as a UK-based blogger (and more importantly consumer) or stumble across anything really worth telling you about. If my Twitter and Instagram comments are anything to go by, you want to see these innovations too, and are a little bit underwhelmed by the products on shelf from these massive brands; we’re turning more and more to boutique, pharmacy and niche brands to fulfill our need for something more than the norm, and the big boys such as L’Oreal are missing out. Although they have some of the best people working in the labs, and some of the most exciting advances in technology, it seems the UK gets a hard deal when it comes to benefitting from that – all the good stuff appears to make it’s way to either America or China, leaving a huge gap in the middle of all us lot that just want affordable, fun, innovative and effective skincare. Yes, you can pick up a face cream and be somewhat overwhelmed with choice, but when it comes to anything more than that, you’re better off buying a flight out of here and seeing what other markets have to offer. Having spent a couple of days with some of the most interesting people in beauty, it’s just incredibly frustrating to know what’s going on behind closed doors and not being able to celebrate that. Beauty is global. You just have to click onto Instagram and be able to see what’s going on thousands of miles away, so it’s about time brands started to be a little more reactive to our ever changing interests – rather than delving out more of the same. What’s your opinion on the lack of ‘global beauty’? Does it frustrate you that you can’t get your hands on products sooner, or are you not bothered that the UK seems to be getting a hard deal? I actually have a post to come later this week on L'Oreal and animal testing, as we were given the opportunity to talk to them about that. Stay tuned..! Although I live in London, I'm from NZ so I don't think the UK is that hard done by ;-)It is frustrating that products are available in some countries before others but I understand that it's probably market demand.I think the average British/Kiwi consumer is much more about convenience than a multi-layered time consuming routine that a Japanese person would have.Also each country has different consumer demands eg. Alcohol-free is popular in the UK, but most Japanese products have alcohol. I have to read every ingredient list when in Japan to check. Also how much money/time are different cultures prepared to invest? Sheet masks are popular in Japan (many of my Japanese friends use one every evening) however they wouldn't sell as many in NZ as people wouldn't consider it worth the time (many of my Kiwi friends wouldn't even own eye cream – they probably only have a face wash and moisturiser with SPF).And there's nothing wrong with that as in the long run, who cares if you have a slightly wrinkly face if you've used all that 'beauty routine' time to spend time with your kids, do hobbies, etc. – each to their own.In saying that, I purchase a decent amount of skincare and makeup from Japan – and basically all my SPF products. I find their products tend to have very high SPF (50+) and PA rating (++++). They also come in a variety of forms – cream, spray, BB creams, powder, makeup setting spray etc.My favourite recent purchase was Shigaisen Yohou Make Keep UV Spray SPF 50+ PA++++ – you should look out for it if you ever pass through Tokyo :-)Overall, I think companies need to be aware that consumers have access to the internet and can see what's available in different countries. And they need to invest more time and research into investigating what consumers in various countries will actually purchase eg. SPF spray in UK.I get questions on products (especially Japanese ones) on Instagram all the time – I don't think it would be hard for companies to utilise social media for consumer opinions on various products. I think you raise some interesting points and questions Kat, but I guess it's all about having options. I totally get that some products just wouldn't work in certain countries, but when the UK in particular is actively looking for essences and pleasant facial SPFs it seems like a hugely missed opportunity. For many of us beauty is our passion and we want to invest now in our faces of the future, but we don't have the products we'd love to make that even easier. My point is really about listening to consumers and their needs, rather than making incorrect assumptions. I can only imagine your frustration! Haha – exactly! That's why I said I don't think the UK is too hard done by 😉 It's sooo expensive – I always bring back stuff from UK/Japan/US for my mum and sister in NZ. I bet a large part of this is being driven by laws that are country specific. We can't get any of the latest sunscreen technology in USA until years after EU, for example. Maybe the marketing execs need to work on understanding evolving regulations in addition to beauty concerns that are more global. I am sure they realize there would be broader opportunities but perhaps they are prohibited from acting on them. You're very right and this is definitely one of the reasons we were given about the spray SPF for example – but it would make sense to formulate for different countries simultaneously. I'm sure it's more complex than that, but I'd definitely like to know a more in-depth reason why! So frustrating to see this happen time and time again. With global social media, I often see exciting stuff popping up only to get deflated when it isn't available in Europe. The sunscreen spray you mentioned for example would be unique and a massive seller here because there is nothing like it and it can't possibly be that difficult to make a product you are already producing available to a global market. They did open a Sephora here a long time ago, and it didn't work. I think because we had Boots/Superdrug/department stores there wasn't the demand, but I reckon if they opened a few flasghip ones it would make a killing now! I agree with you. While I love their make up and I am not saying that I don't like their skincare, I usually don't find much to excite me in their skincare range, even if I cannot afford other than drugstore price and found myself more trying Superdrug's B. range or other similar brands just because they offer a bit more than same old cleanser, toner, moisturiser. Great article and so true! there all sorts of great products being developed either but we can't get hold of them or have to pay a fortune in delivery costs. I really want to try Charcoal Deep-Pore Cleansing Stick Treatment but am not willing to pay a silly price on delivery as I cannot find it in the UK shops. The same applies with other products I have seen in the past. It's increasingly frustrating.